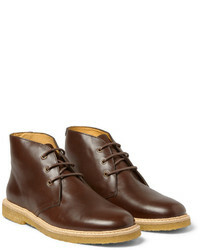 Brown Leather Desert Boots by A.P.C. Contrary to what you might believe, outfiting sharp doesn't take that much the workplace. Just marry a grey blazer with purple chinos and you'll look incredibly stylish. 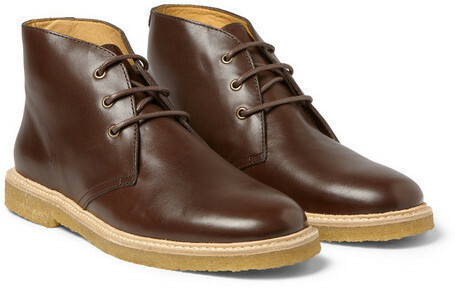 With shoes, make brown leather desert boots your footwear choice. If you're after a casual yet dapper ensemble, consider pairing a navy polo with olive chinos. Both garments are totally comfortable and will look great together. To add elegance to your getup, round off with A.P.C. 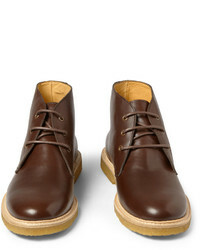 leather desert boots from MR PORTER. If you're in search of a casual yet stylish outfit, marry a light blue polo with red chinos. Both garments are totally comfortable and will look great together. Rocking a pair of A.P.C. leather desert boots from MR PORTER is an easy way to add some flair to your look. If you're on a mission for a casual yet seriously stylish look, make a dark green crew-neck sweater and charcoal jeans your outfit choice. Both garments are totally comfortable and will look great paired together. A.P.C. 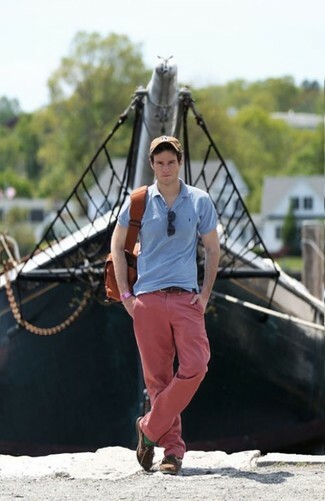 leather desert boots from MR PORTER work spectacularly well with this outfit. For a smart casual outfit, try pairing an olive plaid blazer with teal chinos — these two pieces play beautifully together. When it comes to footwear, this ensemble is round off perfectly with A.P.C. leather desert boots. Contrary to what you might believe, ensembleing seriously stylish doesn't require that much effort. Just dress in a camel overcoat and white chinos and you'll look amazing. For something more on the daring side to finish off this look, opt for a pair of A.P.C. 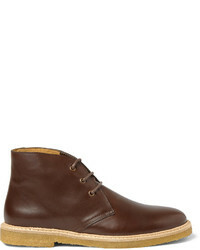 Leather Desert Boots from MR PORTER. 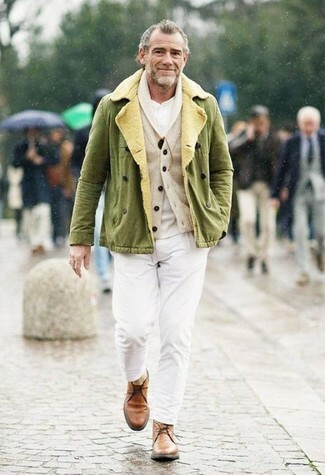 This combination of an olive military jacket and white chinos is clean, stylish and so easy to imitate. A.P.C. leather desert boots are a nice choice to finish off the look. If you're on the hunt for a casual yet on-trend look, team a black leather bomber jacket with navy skinny jeans. Both pieces are totally comfortable and will look great paired together. Amp up the cool of your look by wearing A.P.C. leather desert boots. This combination of a black denim jacket and black chinos is clean, seriously stylish and super easy to recreate. Finish off with brown leather desert boots and off you go looking amazing.